Your 2-day Yosemite tour begins with a scenic drive from San Francisco, passing through San Joaquin Valley along the way. On arrival at Yosemite National Park, your first experience will be hiking to the Tuolumne Grove of Giant Sequoias and having your breath taken away by their size and majesty. This is an unguided and strenuous hike for some so consult with your guide about taking it. 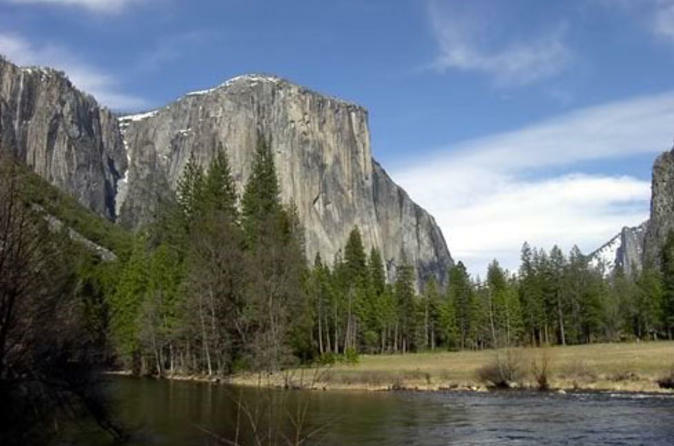 Next, your guided tour visits Yosemite's famous landmarks including El Capitan, Yosemite Falls, Half Dome and the Tunnel View. In addition to offering amazing scenery, Yosemite is home to diverse wildlife such as golden eagles, black-tailed deer, marmots and even black bears – hopefully you'll be lucky enough to spot them during your visit. After your semi-guided tour, enjoy free time to further explore Yosemite at your own pace. There are numerous activities for all interests - go rafting down the Merced River, try out some rock climbing on Yosemite's granite cliffs, rent bikes, or simply relax on an open tram tour of Yosemite Valley (not included in tour price). Then, when the tour buses depart for the evening, you can sit back, relax and watch the sun set over Yosemite. Choose from 2 different styles of accommodation to suit your budget for your overnight stay in Yosemite. Settle in at the comfortable Yosemite View Lodge or enjoy convenience and scenic location of Yosemite Valley Lodge. On day 2, after having enjoyed a morning of free time, rejoin your tour group for the afternoon’s guided tour. You’ll be departing Yosemite in the late afternoon, arriving back in San Francisco by nightfall. Drop off at your San Francisco hotel is included.